Laugh, sing and stumble your way through the Faire in a guided tour of our finest pubs! The Pub Crawl visits 6 pubs – and you receive one drink at each location – anything on tap! Including cider! There are two crawls daily: 11:30 a.m. & 1:30 p.m. 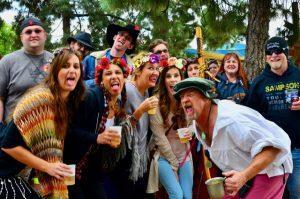 It is $50 per person to join The Pub Crawl in addition to a regular admission ticket. Each crawl is limited to 40 participants. 15 tickets are available for purchase online via ShowClix to ensure your spot. You must redeem your Pub Crawl tickets at the Crown and Anchor Pub. No refunds within 24 hours of scheduled Pub Crawl. A limited number of tickets will be available for day-of-purchase at the Crown and Anchor Pub on a first-come, first-served basis. Meet at the Crown and Anchor Pub for the 11:30 a.m. crawl, or End of the World (near the Joust) for the 1:30 p.m. crawl. You MUST check in 30 minutes before your scheduled Pub Crawl to receive your wristband. No wristband means no Pub Crawl. If you are late, you will not receive all 6 drinks. No refunds. NO CHILDREN under the age of 21 are permitted to accompany the Pub Crawl for any reason.